On December 28, 2011, more than 8 million people received an email from the New York Times regarding a recent cancellation request for their newspaper delivery. The problem is, the majority of those people had not cancelled their subscription and many didn’t even have home delivery. 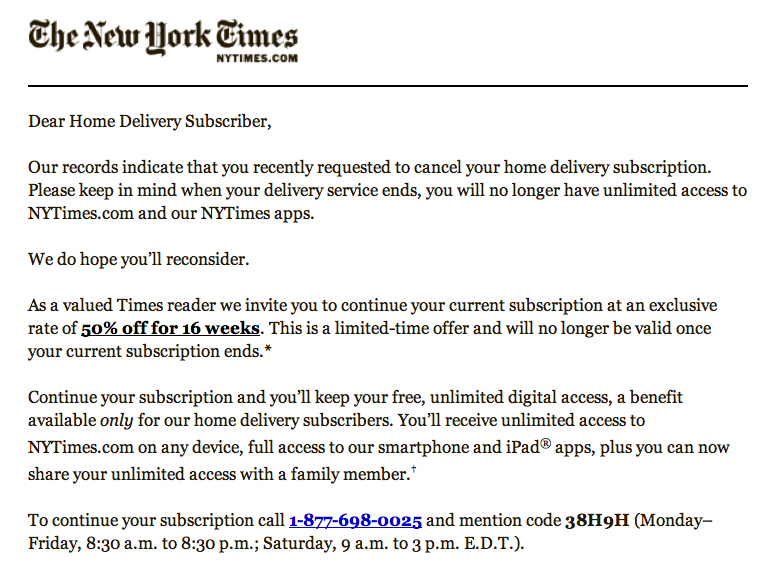 This could be considered SPAM, however it appeared to be actually sent by the New York Times, there were no harmful attachments or links to phishing sites, and it instructed the recipient to call an actual New York Times phone number if interested in receiving a discount using an actual New York Times discount code. Any time an error like this occurs, it leaves a negative impression on the recipient. Even if the recipient has had nothing but incredible service, a foul-up like this can be confusing and conjure the question of if a company can make a mistake like this, what other mistakes are they making? What’s important is how the situation is handled. Customers don’t need to be bogged down with details but it’s also important to not leave them confused and questioning the integrity of your company. If past experiences have taught us anything, it’s that the truth will always come out. While the New York Times initially stated the email did not come from them, after further investigation, they realized it had been sent to a large number of recipients in error, when in actuality, it was meant to only go to a small number of recipients—those who had actually cancelled their delivery services. So while 8 million people may have been confused for a couple hours, there was really no harm other than the confusion and the quick resolution prevented this from becoming a big ordeal. Commenters on one news site reporting this incident joked that they had been spammed and should start a support group, obviously taking the error very lightly. Luckily for the New York Times, this error will probably end up barely causing a blip on the e-mail blunder radar, but not every company survives with recipients joking about the error. Have you had any email blunders? What happened? How did you handle the situation?